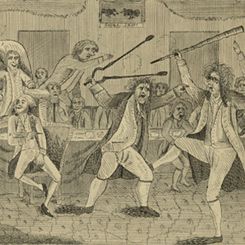 About this object A colorful Member with a fiery temper, Matthew Lyon is depicted in this infamous print with Roger Griswold of Connecticut. On this date, Matthew Lyon, one of only a handful of U.S. House Members to represent two states, died. Born in Ireland before sailing to the American colonies in 1765, he entered indentured servitude to pay his passage. In 1774, Lyon moved to the territory that would eventually become Vermont. In 1776, Lyon joined the Continental Army. He was dishonorably discharged following a disputed account in a battle along the northern border, yet Lyon continued as a military scout until he resigned in 1778. Following the Revolution, Lyon helped found the state of Vermont and grew rich off of his manufacturing pursuits. He also founded a newspaper supporting Thomas Jefferson’s Republican Party in 1793. Following three unsuccessful attempts, Lyon won election to the House of Representatives for the 5th Congress (1797–1799). Lyon remains one of the House’s most colorful characters. He participated in an infamous floor brawl with Representative Roger Griswold of Connecticut, and was eventually imprisoned for violating the Sedition Act in 1798, after accusing President John Adams of having “an unbounded thirst for ridiculous pomp.” While he railed against the unpopular legislation from his jail cell, Vermont voters re-elected him. When the historic presidential election of 1800 went to the House because of an indecisive Electoral College outcome, Lyon cast Vermont’s vote for Jefferson. Having not sought re-election in 1800, Lyon moved to Kentucky where he founded several businesses. Lyon won re-election to the House from that state in 1802, becoming the second Member to represent two different states in the House. His opposition to the War of 1812 ended Lyon’s congressional career. A downturn in his businesses in 1820 led him to seek a federal patronage position as U.S. negotiator with the Cherokee Indians. It was in this capacity that he died in Spadra Bluff, Arkansas.